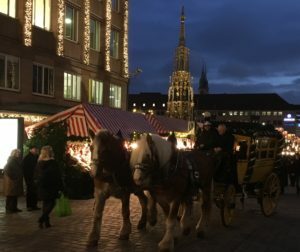 My Favorite Christmas Markets in Germany – And Why You Will Love Them! Ah, it is this time of the year! And even though I am 26 (what already?? ), I love the Christmas season! I love mulled wine, Christmas music, Christmas stories, lights, some Christmas movies, Christmas Cookies, etc. … You get the idea. But what I really love are Christmas markets. The smell of cinnamon, mulled wine, greasy food, and other Christmas treats combined with the lights, and the music is just magical for me. 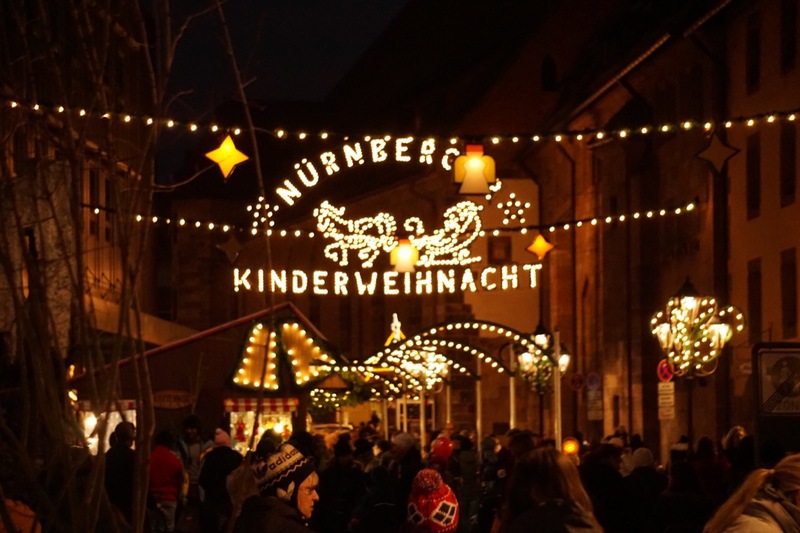 And maybe that is because I was born and raised in Nuremberg, the mother of all the Christmas markets out there. 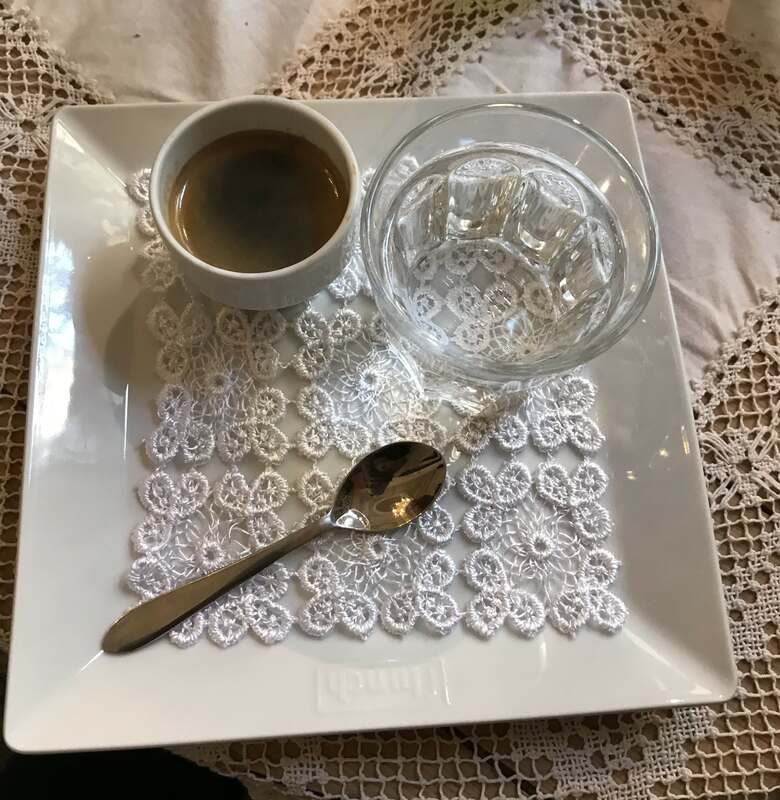 So, as I wanted to share some holiday cheer, after hanging out under palm trees and in the busy streets in Havana for the last couple of weeks, I think it is about time. So here are some insights to Christmas Markets in Germany and my personal favorites. If you would rather know more about the jolly season in Cuba, head over to this post. The markets go way back. In fact, the first ones were held back in the middle ages, and they originate in Germany and in the German-speaking parts of Europe. 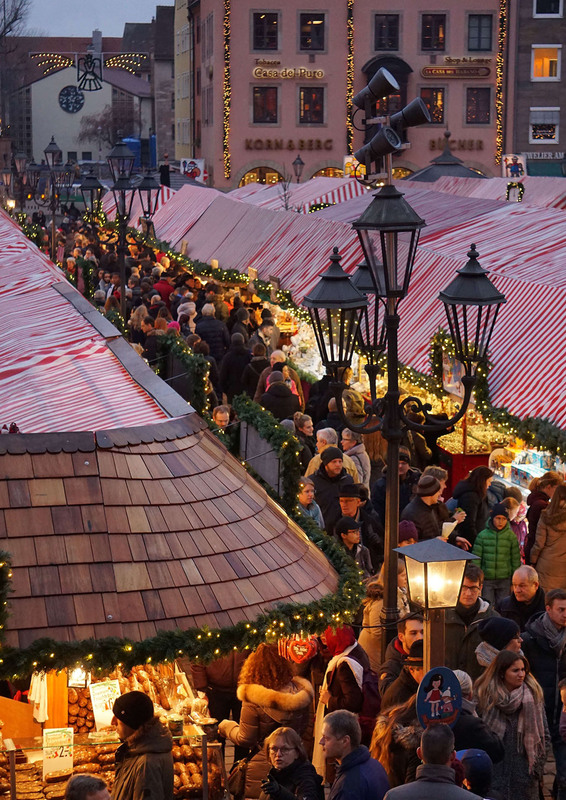 They usually start Friday before the first Advent, meaning 4 weeks before Christmas Eve and they consist of many different stalls selling food, drinks, and arts and crafts. They usually also have a nativity scene in their center and a stage where local talents and kids from local schools perform Christmas Carols. The stalls are carefully designed, and every year the markets take great care of looking similar and that everything fits together. Every German city has at least a small market, but some have a long tradition and more famous than others. But also the small markets have their special something so why not include them when you are around for Christmas anyway. The markets close around December 24th so make sure to stop by before. Start with my favorites, you will love them. This city one of the best European Christmas destinations. With its medieval city center and one of the oldest Christmas markets with a long tradition. Although it is not 100% clear when it exactly started it turned into one of the biggest and most important Christmas markets in Germany. There are many highlights you can combine with a visit like the Gingerbread café and manufacturer, right by the market. There are even Christmas tree decorating courses and other fun activities for visitors. You can, for example, take a carriage ride or ride the antique carousel at the children’s market. trademarked mulled wine, and try the local sausages at the Bratwursthäusle. It is one of the most traditional places to have the regional treat “Drei im Weckla.” and the sausages in the bun are rather cheap at this place. You can find it just by the main square and very close to the Christmas market. 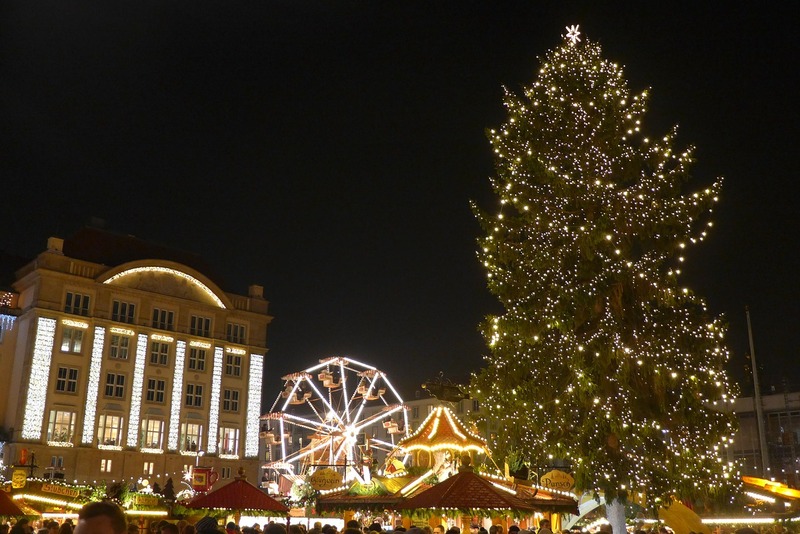 Nuremberg turns into a Christmas wonderland every year around the holidays. If you look for some extra Christmas feeling, be there for the opening ceremony and enjoy the kick off by the real-life Christkind (a local golden angel). The market combines three markets: the main one, the children’s market and the sister city market, where you can find treats from all over the world. The Christmas Market in Dresden has a really long tradition as well and is one of the prettiest in my opinion. It dates back into the 15th century, and the name comes from the famous Christstollen. A typical cake filled with raisins and powdered with sugar. You can still try a piece of this traditional cake while wandering around the market stalls. As the market is held in the old town of Dresden, you will be surrounded by architecture gems covered in lights. The market is also home to the biggest wooden Christmas Pyramid. Also located in the eastern part of the country is Erfurt, a cute town, with one of my favorite Christmas Markets in Germany. It lies just under the cathedral and is surrounded by beautiful buildings. The stalls are little huts painted in the same color, and there is a lot for kids to discover. Every year they lift up a 25m high Christmas tree and decorate it with lights. While you are there, you should try one of the typical sausages and take a ride on the Ferris wheel. Those you just find on Christmas markets in the eastern part of Germany, by the way. The whole city is an excellent destination for Christmas holidays. 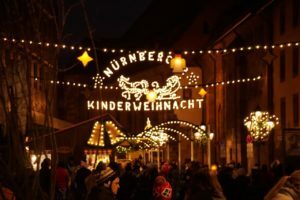 But if you are really serious about spending some Christmas days on a Christmas market in Germany, you should definitely visit the Bavarian town Rothenburg. Not only is Rothenburg home to the famous brand Käthe Wohlfahrt, but that is also famous for their Christmas decorations, and the Christmas museum. It is also home to many small and pretty Christmas markets. And even though it hurts me a little as a fellow Nuremberg native, I would give the town the title: “Christmas city.” The entire town turns into a Christmas village and makes you feel the spirit in the charming streets and their decorations. Make sure to try the typical Schneeball. It is a cookie ball covered in chocolate or sugar. Of course, there are other markets worth a visit. Some people like the one in Munich or Stuttgart a lot. The best way is to explore and find your personal favorite. Whichever it will be I wish you a very happy last week until Christmas and a happy new year! Where will you spend it? Whenever I visit my family in Nuremberg, I try to do a little exploring in the town I grew up in or its surroundings. There is a lot to say about Franconia and the small towns all-round the area. But this time I will take you, Bamberg. A city, that was first mentioned in 902 and was declared UNESCO world heritage in 1993. It is packed with sights, cute shops, and beer. Only in the city itself, there are around 7 breweries and the area around it has the biggest density of breweries in the world. That said, you have to know that every beer is unique and they do have their own secrets of brewing perfect beer. But apart from a long brewing tradition, Bamberg has a lot of historic sights to show. It used to be and is still an Archdiocese of the Catholic Roman church. Being a diocese the city has a lot of stunning churches and monasteries that are still functioning sometimes and you can visit most of them. 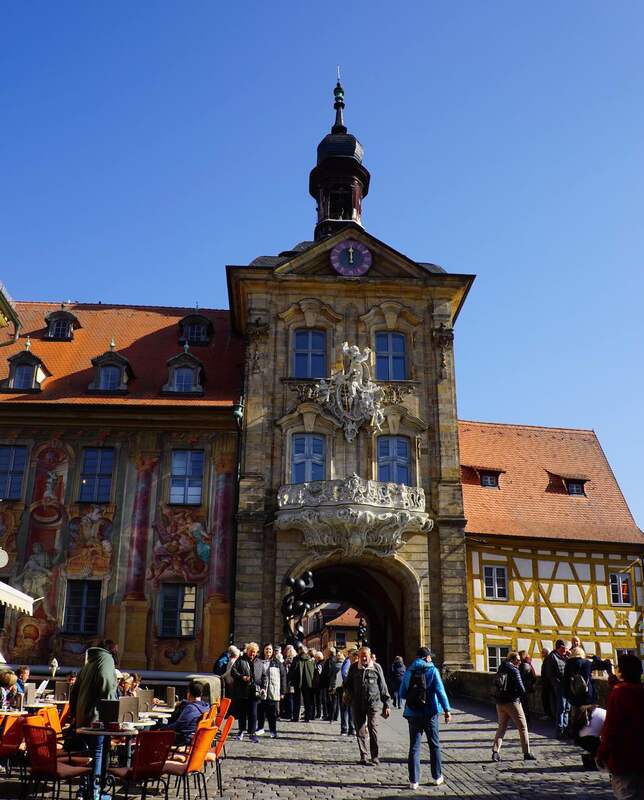 There is a lot to discover in Bamberg, especially for history lovers. The main attractions are the Cathedral, the Residenz and the old Town Hall. Oh and of course the Schlenkerla, but more about that in a bit. 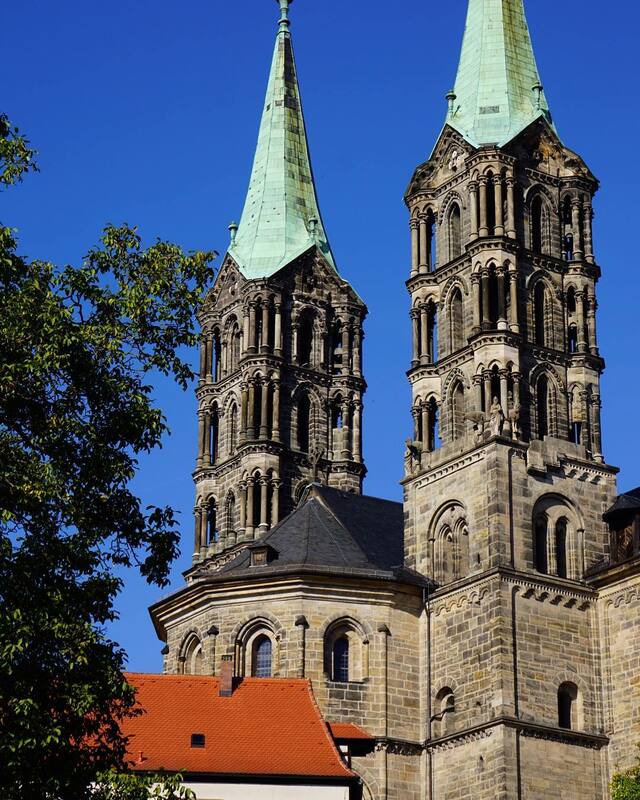 After turning into a diocese Bamberg was enriched by gifts from the pope and gained more and more importance. The emperor Henry and his wife Kunigunde (yes that was her name) also gave wealth and some of their most important possessions to the town and it turned into an important center of the Holy Roman Empire. Now you can still visit the Cathedral and the place where the emperor used to stay during his visits to the city. I highly recommend taking a walking tour in the city or one of the tours covering the 7 hills around Bamberg to get a better view of the city and historic insights. The city kept getting richer and more important after the middle ages and a lot of new buildings joined. In 1647 the University of Bamberg was founded and it is still an important University town, which gives the city a young vibe as well. The city was always an important place for the Catholic church and that lead to it being connected to the German railway system very early on. The Cathedral and the Landmarks around like the Residency and the monasteries are open every day. It is worth taking a guided tour if you would like to learn more details about them. Make sure to also stop by at the Rosengarten (rose garden) close to the residence for a perfect view on the city. There is a lot to see for architecture lovers as the city changed a lot over the years and has medieval buildings, modern ones and a lot of Baroque ones as well. One of the biggest sights in Bamberg are the breweries and the long beer brewing tradition. On one of the hills in the city the Michelsberg you can find the Franconian Brewery Museum, where you can learn everything about the local Beer traditions. And let me say that, Franconia has the best beer in the world. The Brauereimuseum opens from April to October from 11 am until 5 pm on the weekends and from 1 pm to 5 pm on weekdays. You can also book separate tours when you come with a larger group. The beers in the area can be quite heavy as the monks used to brew them during the fasting period. That is also how the famous Rauchbier (smoked beer) started. It still kept them alimented and even tastes like smoked ham or sausages. The pub and brewery Schlenkala is the most important institution for that beer and you can still have one there today. I really recommend trying it. But for your lunch break in Bamberg go somewhere else. I have a special locally abroad tip for you. 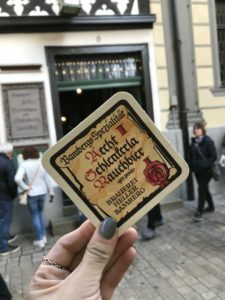 Anyway, make sure to stop by the Schlenkala, it was founded in 1405 and still brews with the same tradition. It is a tourist hotspot so it is best if you before noon or after lunch hours to have a beer outside or in the traditional pub. So, speaking about lunch. As mentioned there are many different breweries that also offer typical beer gardens and traditional food. 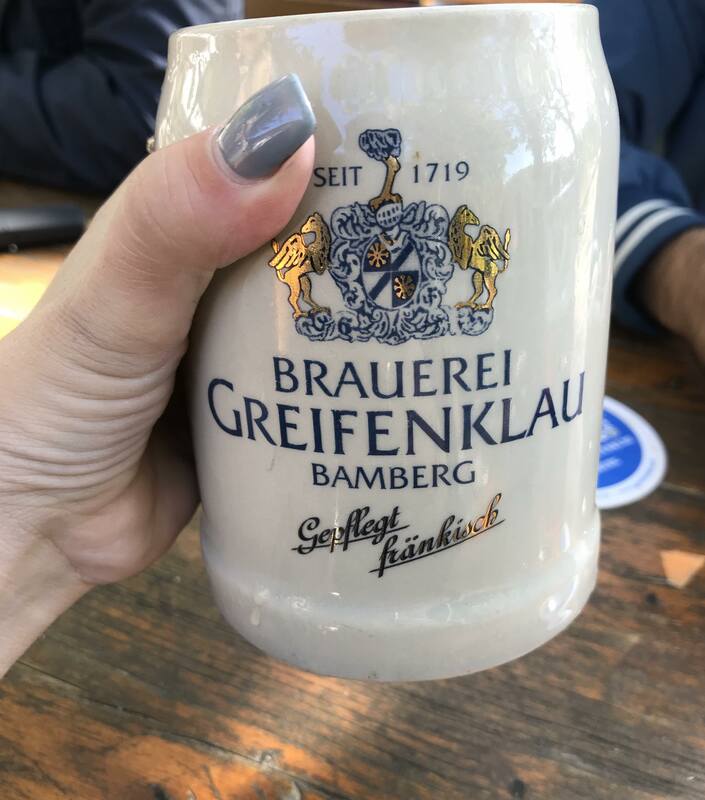 A real highlight for me is the Gasthaus Greifenklau. It is a bit outside of the city center and not overflooded with tourist. They brew their own beer. 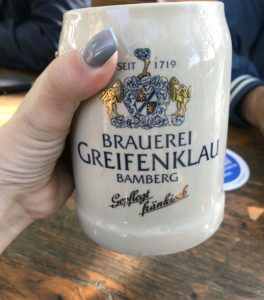 The most traditional one is the Kellerbier (a strong and tasty brew served in a jug that keeps it cold and fresh). Or try the dark beer, which they just offer in some months. The food is traditional but they do not mind if you want to make some adjustments. 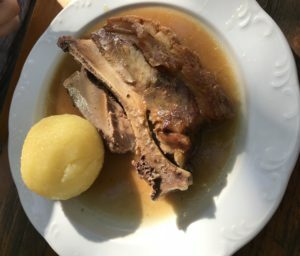 The best dish is the typical Schäuferle with a potato dumpling and some Wirsing or Kraut. The beer garden has a great view. Also, the staff is really friendly and they even speak English and are happy to explain the dishes and different beers. After that, head back to the center for coffee and a piece of cake. 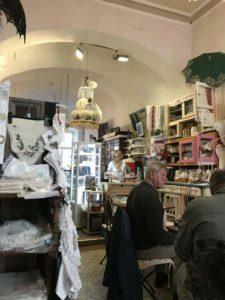 I can really recommend the cozy café and shop Spitz Rein. They even offer vegan options. The shop sells lace and the cakes are homemade and it makes you feel like being in a grandmother’s house. You can find it in this address: Obere Sandstraße 6. After that is just worth wandering around the streets. Make sure to get into some of the arts and crafts stores to get a unique souvenir or some handmade jewelry. The city is quite well connected by train and bus. You can also rent a car in the close by Nuremberg and drive up there. The easiest way to get to Bamberg from the bigger Nuremberg is the S1 a regional train that takes you there in about 1 hour. There are many trains heading there, there is one about every 20 minutes. Have a look at the DB Schedule to be sure. You can also reach Bamberg from Berlin and other major German cities. 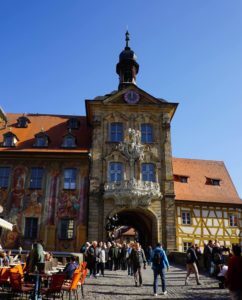 Bamberg is perfect for a day trip! The best advice is just to get lost in the tiny streets and wander around little Venice just by the river Regnitz. The best time is to go now on a sunny autumn day! You will love it!